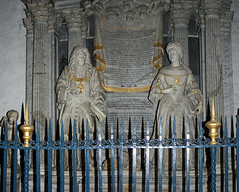 The Clayton Memorial, was put up by Sir Robert Clayton during his own lifetime, in 1705, in honour of his wife. Sir Robert was Lord Mayor of London, Member of Parliament for Blechingley, and a benefactor of St Thomas's Hospital and Christ's Hospital. He lived at Pendell. It is by Richard Crutcher and is considered one of the best examples of the work of that period. The fine wrought-iron railings are contemporary and were painted blue and gold. On the south side of the High Altar is the table tomb of Sir Thomas Cawarden d.1559. The brass plate was discovered in 1836 at Loseley, near Guildford, where Cawarden's friend Sir William More lived, and it was only then put on the tomb. Sir Thomas was Master of the Revels under four sovereigns including Henry VIII, and a patron of English drama. He was steward and keeper for Anne of Cleves when she was given Bletchingley by Henry on her divorce. After 1547 he became owner of the Manor. An ardent reformer under Edward VI, he removed the rood and other fittings from the church. He managed to square his conscience under Queen Mary but died in the Tower under Elizabeth. The list of Rectors goes back to 1293 and includes Thomas Herring, who became Archbishop of Canterbury in 1747, and his succesor John Thomas who was made Bishop of Rochester in 1774. He is buried in a vault (unmarked) beneath the church. Another notable member of the parish clergy was Archbishop Desmond Tutu who was an honorary curate here in 1966.